It’s only natural that Sweet Leisure asked Deborah Hartz-Seeley to suggest places tourists would like to eat when visiting Greater Fort Lauderdale. Debby knows all about South Florida’s unique cuisine. 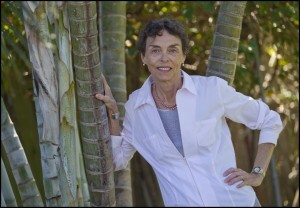 After all, she spent over 20 years as the prize-winning food editor for the South Florida Sun-Sentinel. That’s a Tribune Co. newspaper serving the greater Fort Lauderdale area and beyond. Debby’s food experience began early. She worked in a pizza kitchen and a steakhouse to put herself through school, earning a Bachelor of Arts degree from the University of Wisconsin and a Master’s of Science in food journalism from the University of Wisconsin. Although Debby retired from the newspaper, she still lives and dines in the area. And she still writes about food for publications including The Coastal Star and The Miami Herald. Casual, inexpensive, good—thank you, Debby. 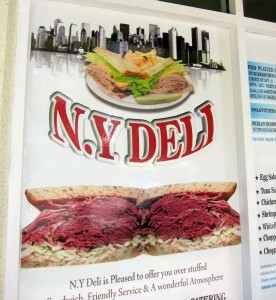 3916 N. Ocean Dr., Fort Lauderdale, 954-566-2616 Kosher-style delis are a dying breed in South Florida. So thank goodness for this newly opened family-owned business that is our go-to place for a late Sunday breakfast or midweek lunch.The women behind the counter are the owner’s wife, mother-in-law and often young daughters. On Sundays a cousin pours coffee. Here you can order lox (salt preserved salmon) as well as nova (smoked salmon) to put on an authentic bagel that’s boiled not steamed. Kippers are a taste of the old country. Fresh salads and big deli sandwiches are here too. There’s also a whole menu of other breakfast and lunch favorites including hearty soups, burgers and just about anything else you want.The atmosphere will have you thinking of Manhattan replete with subway signs, black-and-white photographs and the NY Post available for reading. The deli is open daily for breakfast and lunch; dinner is served Tuesday through Saturday until 7:30 p.m., when the regular menu plus specials such as brisket, meatloaf and stuffed cabbage are available. 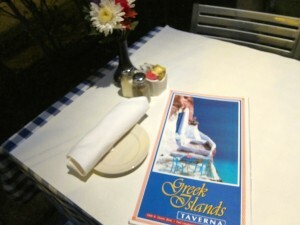 Down the street you will find a traditional taste of the Mediterranean a block off the Atlantic Ocean. You can sit indoors at this taverna with its checked tablecloths. It is always bustling. If you prefer you can sit on an outdoor patio that the owners have done what they can to camouflage from the major street that passes out front. Partial to eating light, we select a few meze including scordalia, melitanosalata and taramosalata. And we follow that with a horiatiki salad made the right way without lettuce. For those with heartier appetites there’s plenty of well-prepared lamb, seafood, chicken and pork dishes. My granddaughter ate her first roasted squab here and has been a fan ever since. You won’t go wrong. For a quintessential Fort Lauderdale experience, drive over the plank bridge at the entrance of this Polynesian pleasure dome called the Mai Kai. 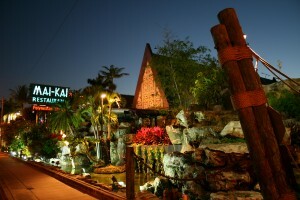 Anyone into tiki culture will know the place with its islander revue of dancers, drummers, musicians and fire eaters. It’s filled with authentic finds such as spirit filled wooden gods, carefully turned sailor’s knots and skillfully woven grass. You can almost believe you’ve been transported to the islands. The Molokai Bar is designed to resemble the lower deck of a ship or perhaps the captain’s quarters. Out back a waterfall is the centerpiece of a tropical garden. Enjoy a Cantonese-inspired meal or just pick out a rum-laden cocktail from the oversized libations menu. This is a true touch of Old Florida. The dependably good Italian food served by a professional staff has been drawing crowds to this family-owned restaurant for many years (at least the 25 I’ve lived here). We go for hearty bowls of pasta e fagioli served with the crusty house rolls. I like mine without garlic; my husband likes his heady with the stuff. This is also one of the few places you can find a meaty Bolognese sauce. And it was one of the first places in town to serve burrata cheese. They go a little trendier in nightly specials. But here you can’t go wrong if you stick with tradition. In an unassuming strip mall you’ll find this touch of island life. The couple that owns it knows the regulars and will make you feel welcome. 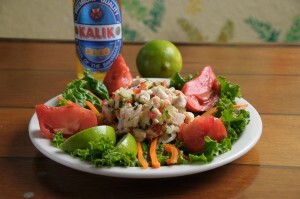 The place can be noisy as people tuck into conch fritters, beans and rice, Jamaican fish cakes called Stamp and Go, cutters (sandwiches) and a variety of fresh catches served fried or grilled. There’s also jerked chicken, pepper pot soup, island curries and grilled (not fried) conch. Check out the blackboard to see what’s freshest and best. Head a little farther north to find two French women serving classic bistro fare. The world has become so hip and trendy it’s difficult to find these old favorites including vichyssoise, duckling a l’orange, filet of sole Meniere and frogs legs Provençale. You can order complete meals (includes dessert and coffee or tea) or a la carte. When snowbirds descend, this place is popular with French Canadians. My husband is partial to the beef bourguignon; I like the pan-seared salmon with dill sauce. Many entrees come with two vegetables (purees are popular) and potato (often mashed). The room itself isn’t fancy but is nice enough that you feel like you’ve been out to dinner. And the owners, who serve as wait staff, are happy to chat. That brings up another plus: the place is quiet enough for conversation. 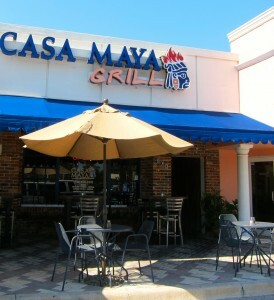 In a large shopping center called The Cove, you’ll find Casa Maya tucked among the shops. This restaurant was started by a young couple in 2008 and has since become a neighborhood favorite. Booths and tables fill the small interior decorated with items that owner Emilio Dominguez has brought back from Mexico with him. When it comes to food, don’t think plates groaning under oversized burritos smothered in cheese. And flabby refried beans. The food here is much more refined featuring many of the dishes and sauces that Dominguez learned to prepare from his grandmother growing up in the Yucatan area of Mexico. A favorite is achiote-marinated pork, slowly roasted and served with pickled red onions. Here burritos can come filled with lean white meat chicken topped with a pumpkin seed and cilantro sauce. The chile rellenos is filled with seafood and baked not fried. Or try the fajitas of sour orange marinated pork loin. They don’t have a liquor license so margaritas are made with wine not tequila. So go ahead and have two with or without salt. You can’t come to Fort Lauderdale without eating some place with a water view. 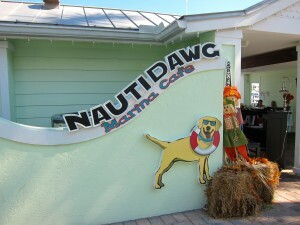 Our choice for a casual meal is the Nauti Dawg set in a marina on a canal just off the Intracoastal Waterway. You may have trouble winding your way through Lighthouse Point to find this spot. But it’s worth searching out. Forget about sitting indoors; be sure to wait for a spot on the wooden deck. There’s often live Caribbean music and, after dark, the kids will enjoy watching fish swim by where the water is lighted. Come for breakfast if you are up early enough and you’ll choose from omelets, breakfast sandwiches and an assortment of other eye openers including coconut French toast. At lunch or dinner there’s a nicely filled lobster roll (yes, they use Maine lobster) or you can have the lobster served as a salad. Fresh fish is always available as are hearty burgers, salads, pasta dishes and more. Nightly specials are listed on a blackboard by the front door and these items tend to be trendier. 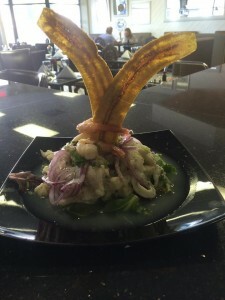 Part of a family-owned group of local restaurants, this eatery features Mediterranean, Cuban, Mexican, Peruvian, Argentinean, and Asian dishes including sushi. This mix offers something for everyone. 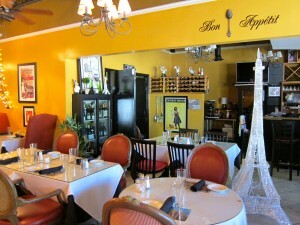 And what it offers is good food at reasonable prices in a surprisingly upscale atmosphere. Even the service overseen by the wife/owner is professional. I go for the pollo a la plancha that is a pounded and grilled chicken breast with sautéed onions. It covers the plate. My husband likes the churrasco, grilled skirt steak with chimichurri. I’m also partial to the aquadito soup that’s cilantro-based and studded with seafood. There are other outlets in Fort Lauderdale (233 Florida 84, 954-467-5114) and Deerfield Beach (614 E. 10th St., 954-480-9919). I’ve heard good things about the Fort Lauderdale location but this Lighthouse Point location is the newest and our favorite.